NOW AVAILABLE: Getting Jefferson Right in paperback. Many have asked for it and so here it is in print. It will be available on the main Amazon site in a few days and then in stores within a month. 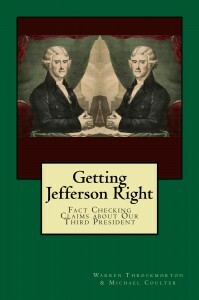 The eBook, Getting Jefferson Right: Fact Checking Claims about Our Third President is still available on Amazon.com and Barnes and Noble (only $4.99 both places). Click the links to see the pages and purchase the book. You can view the book on any wireless device and any computer. Check here to learn how you can read this book on any device you own (Amazon). They [Throckmorton & Coulter] find without fail that the claims [in The Jefferson Lies] fall into one of the following categories: 1) complete falsehoods (there are plenty of those); 2) misleading falsehoods (such as the story about wanting Christian imagery on the national seal – true, but on the other side of the seal, had Jefferson gotten his wish, would have been a pagan story); 3) true, but entirely irrelevant and ultimately misleading statements (such as signing documents with “the Year of our Lord,” which he did because pre-packaged treaty forms had that language, and had about as much meaning as signing “Dear” in our salutations in letters to complete strangers); 4) statements with a “kernel” of truth but blown so far out of proportion as to end up being false (such as Jefferson wanting federal funding for Indian missions, when in fact the titles of the bills simply took on the name of already existing religious societies; 5) baffling assertions that are so far out of the realm of reality as to be neither “true” nor “false,” but simply bizarre (such as Barton’s defense of Jefferson’s views on race, which were disturbingly ugly even by the standards of his era). I cannot recommend this book highly enough. It is absolutely essential to read this book if you intend to read Barton’s. Significantly, the authors are not atheists: they are both professors at conservative Christian colleges who assert that Christian ethics and belief inform their scholarship. They are both, in the end, honest scholars willing to examine the facts on the ground and render the necessary judgment: and therefore in the end, they are everything Barton is not and their book is everything Barton’s will never be: actual history. I cannot overemphasize the importance of reading Getting Jefferson Right, by Warren Throckmorton and Michael Coulter. It is a point-counterpoint to David Barton’s, aptly titled, The Jefferson Lies; and, it corrects every myth that Barton presents. Every evangelical pastor in America, especially African-American pastors, needs to not only read, but also study the facts in Getting Jefferson Right. For too many years, David Barton has misled pastors across America and this book is the perfect tool to help bring us back to the true, undiluted life of Thomas Jefferson. Christians are rightly distressed when American history is purged of its religious elements. But that’s no excuse for us to reconstruct the views of Founders such as Thomas Jefferson according to our likeness. 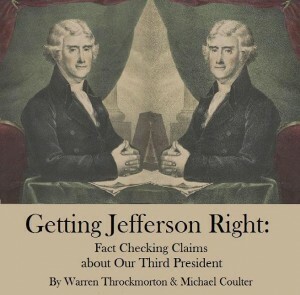 In Getting Jefferson Right, Warren Throckmorton and Michael Coulter have done all of us a great service by exposing, carefully and dispassionately, so many of the popular distortions and half-truths about Jefferson. In the process, they have modeled how to deal with historical texts honestly. If you are interested in learning about the real Jefferson, you owe it to yourself to read this book. Professors Warren Throckmorton and Michael Coulter thoroughly refute David Barton’s attempts to transform Thomas Jefferson into an orthodox Christian hero. By meticulously quoting Thomas Jefferson, extensively and in proper context, they disprove all of Barton’s major assertions. Not only is this a fantastic rebuttal, but it serves as an excellent source for any student of history interested in learning more about the real Thomas Jefferson.